New for 2016, we are pleased to introduce our 7 mm tooling - Quad7. This new plant is based on our already tried and tested 'C' fin layoutbut now with enhanced 7 mm tubing to ensure optimum performance and potentially offer cost savings when compared to the larger tube versions of the same product. We plan to start shipping pre-orders for this new coil style from June 2016 onwards, so reserve your place in the list NOW! 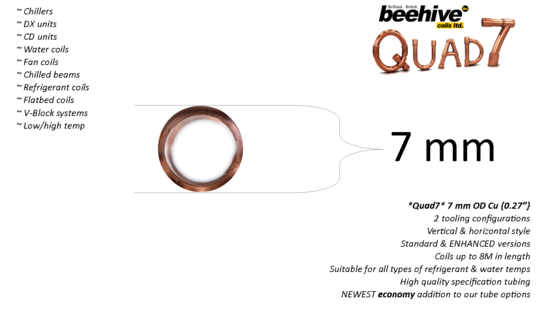 Please contact our sales team on 01638 664134 for more information on Quad7!